R3 Stem Cell’s Founder and CEO, David Greene MD, MBA, recently presented in front of standing only crowds at two regenerative medicine symposiums in China. The attendees at the seminars were excited about regenerative therapies with stem cells, exosomes and growth factors. Many want to come to the US for first rate therapies! 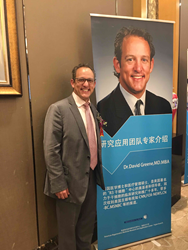 R3 Stem Cell’s Founder and CEO, David Greene MD, MBA, recently presented at two regenerative medicine symposiums in China. The presentations took place in both Fuzhou and Changdjou, with several Chinese dignitaries in attendance. The standing roomy only presentations occurred in front of hundreds of individuals interested in learning the latest advancements and research available regarding stem cell therapies. As the leader in offering regenerative therapies in the US, R3 Stem Cell’s Centers have performed over 10,000 successful procedures at thirty four Centers across the country. Through a translator, Dr. Greene was able to convey the basics about stem cells and how they work in the body. In addition, Dr. Greene explained how the regenerative biologics are obtained and regulated, and then answered questions from the large crowds in attendance. The regenerative procedures at R3 Stem Cell have been very effective for all types of arthritis, neuropathy, organ failure, autoimmune syndromes, diabetes, stroke and dementia. Dr. Greene explained to the large crowds that the therapies are not curing any condition and are considered experimental, so it is important to maintain appropriate expectations. Currently, R3 Stem Cell offers free consultations at all of its affiliated Centers. The Regenerative Medicine Research Center in San Gabriel CA is a first rate clinic that caters to Chinese patients with concierge packages and therapy with a Board Certified provider - Dr. Yuan. Visit http://r3stemcell.com to find the nearest location in the States, or simply call (844) GET-STEM for more information.